Hershey Blaze coaches come from all types of backgrounds here in the Central PA area. While our track and field abilities vary- the main goal is to provide a fun & safe environment for the children to enjoy this great sport while competing at a high level. All HBTC coaches are registered United States Track & Field(USATF) coaches and some have children competing in the club. We are truly a family environment. HBTC coaches are also recreational athletes who run in various 5K's, half marathons and marathons. We don't just talk the talk...we are examples!! We're always looking for additional help & expertise with our youth. If you'd like to volunteer your time and become a coach with Hershey Blaze please contact us at hersheyyouthtc@gmail.com. Bio: Alan Paynter was inspired to form the Hershey Blaze Track Club by his own personal childhood experience with the Cinnaminson Track Club in NJ. By the time he and his wife settled in Central Pennsylvania and had their own children who wanted to run track they learned there was nothing in the area. So they entered meets as unattached runners and competed alone. With the support and addition of a few other families in the spring of 2013, all of that changed. The Hershey Blaze Track Club was born! Coach Paynter was a sprinter and football player at Lenape High School in South Jersey and earned a scholarship to the Division II West Virginia Wesleyan College. After 2 years in WV, he transferred to Kutztown University to play football. Upon graduation from college Coach Paynter accepted an assistant football and Head Boys & Girls Track Coach position at Central Catholic High School in Reading, Pa. His athletes at Central went on to earn more than 30 District & State medals and have become some the most successful track & field athletes in the school's history. Currently Alan works for Dickinson College in the office of admissions. Additionally, both he and his wife Jennifer have also been relief houseparents at the Milton Hershey School for 17 years. Coach Paynter has worked in education and non profit organizations for over 20 years and considers working with young people his calling and life's work. Alan is a member of Iota Phi Theta, Fraternity, Inc., enjoys exercise and fitness as well as riding his bike. He has already completed several marathons and half marathons and soon taking on triathlons. Jennifer is often referred to as "the glue that keeps the club together and running". She is responsible for most of the day to day organization of the club as well as being the parent of 3 standout athletes. As a child, Jennifer herself was a multi-sport athlete from the Big Spring School District in Newville, PA. Her athletic talent as a defensive back in Field Hockey landed her a scholarship to play for the Kutztown University Golden Bears. It was during their college years when she and Coach Paynter met. As athletes, they often spent time working out together in the off season. ​Jennifer is an at home mom and also the owner of Perfectly Paynted by Jennifer. She produces some of the best custom cupcakes and cakes one could ask for. Her baking has long been one of her greatest talents known by all. 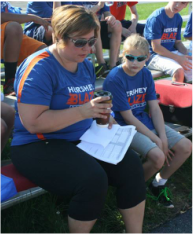 But it is the care, dedication and passion that she puts into that business that also fuels the Hershey Blaze Track Club. Coach Dave and Coach Josie are parents of two of our youngest Blaze athletes and a constant figure at our practices supporting all of our "Blaze Mini's". Both are highly competitive and experienced marathon runners as well as triathletes. The energy and commitment they bring to the organization is second to none. When they are not coaching they can almost always be found training intensely for their next major event. Coach Cerminara has over 10 years of experience competing and coaching in the sport of track and field. Born in Richmond, VA, John grew up in Williamsburg, VA and attended Jamestown High School where he competed all 4 years in indoor and outdoor track. After competing in sprinting and jumping events, John found his calling, excelling at discus and shot put his senior year. He finished his senior season with a District Championship in Discus and a 12th place finish in the State AA Championship Meet. Looking to extend his throwing career, Coach Cerminara attended school at Penn State Erie, The Behrend College where he majored in Management Information Systems. In Behrend’s NCAA Division III program, John had multiple seasons of success in all of the throwing events (shot put, discus, javelin, weight throw and hammer). By his junior season he was named team captain and by the end of his career he was a 3 time Team Most Valuable Player, 5 time Mason Dixon Conference Champion, 2 Time ECAC DIII All-Conference, and 2 time NCAA DIII National Qualifier for discus. Coach Cerminara is looking to bring his excitement and enthusiasm to the throwing events for the Hershey Blaze as well as create a safe and accepting environment for any young athletes looking to learn how to throw. Since having coach John join us, Blaze throwers have been among the top medalists at every event we've attended. J.D. has participated in track and field since his days at Everett Area High School in Bedford County. J.D. is a multi County and District place finisher in track and field and an All County and and All Conference MVP as a running back in football. J.D. specialized in the 400, 800 and relays as a track athlete. After high school, he continued his track and football career his freshman year at St. Francis University. J.D. later transferred to Shippensburg University where he obtained a Bachelor's degree in Criminal Justice. J.D. is also married to Tara Albright, who is the unofficial team photographer. J.D. and Tara reside in the Susquenita School District with their two children who compete in both track and cross country. Coach Hardison was a sprinter, basketball and football player at Greater Johnstown High School in Western Pennsylvania and earned a football scholarship to the Division II Indiana University of Pennsylvania. While participating in football, he walked onto the track team to help develop more speed and endurance for the upcoming football season. Coach Hardison broke three track & field records while in college 100m Dash, 400m Relay and 800m Relay. During his junior year, Mario qualified in the 100m Dash, for the National Division II Outdoor Track & Field Championship in Riverside, CA. Coach Hardison holds a Bachelors Degree in Business. Mario enjoys helping sprinters build the foundation needed to exceed in their track future. 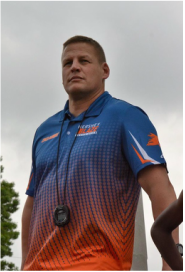 ​Coach Mobley brings years of experience as a college football player and high school coach to the Hershey Blaze Track Club. He also was a high school track athlete at Harriton High School before college. Kevin earned a scholarship to play football at Kutztown University where he was a standout Defensive Back and recently named to the University's All Decade Team. As a high school football coach he's been a major part of the success of the Upper Merion High School football program. Kutztown Univeristy is where Coaches Mobley and Paynter developed a friendship. This is where he and his wife Chrissy also met. They are the parents of two amazing young athletes- one of which run for Hershey Blaze Track Club. As much as our coaches bring athletic experience to the sport our true goal is to model lifelong dedication and friendship for our athletes. As a result of this renewed bond between these coaches the Hershey Blaze Track Club is launching its Blaze KOP site in the summer 2016. Together with the Paynters, the Mobley family are dedicated to growing this site as a testament to the great success of the Hershey Blaze Track Club and making the organization a national power. As an Assistant Football Coach at Malvern Preparatory School College Coach Coles brings a love of sports and passion to inspire young athletes to the HBTC- King of Prussia site. A 1997 graduate of Conestoga High School, Dante played quarterback, running back, wide receiver, kicker, punter, and defensive back. He was a three-sport captain for the football, basketball, and track programs and still holds records with their track program. After Conestoga, Coach Coles attended Valley Forge Military where he played football and basketball. He also served as their head football coach. When Jason isn’t manning his station as the race director for the local Healthy Kids Running Series (a group of cross-country races for children ages 4-13), he’s managing the schedules and resources it takes to corral the 240 children and 43 volunteers (and counting!) who currently call the Exeter Township Elite Track and Field program home. ETETF is a recreational summer track program that introduces children to distance running, sprinting, hurdles, shot put, long jump, and javelin. His program, though, goes beyond just the kids. Jason and his team also provide seminars on healthy eating to the kids and parents. In yet another effort to make the lessons from the program extend long after its conclusion, Jason also offers a general fitness and mobility class to parents to encourage healthy households, not just healthy kids. Coach Jason was a distance runner in school winning the District 1 title and placing 18th in the state of Pennsylvania in cross country. Jason’s strong desire to compete didn’t end as he aged. Jason currently competes in Crossfit and placed in the top 5% in the world in the 40-44 age group in the 2016 Crossfit Open and is currently training to improve his world ranking with a goal of competing in the Crossfit Games. 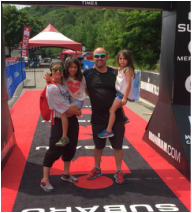 Currently, Jason is an Account Executive with Advanced AV in West Chester, PA.
Coach Julie was born in England where she first gained her interest in track and field. After moving to the US, she continued developing my sprinting skills, qualifying for and placing in the state finals all 4 years of high school. In her senior year, Julie qualified for nationals in both the 100 and 200. Track was a major part of Julie’s college years where she experienced success in the 100, 200 and 4 x 100 in the Northwest Collegiate Women’s Championships. After graduating with a degree in education Julie went on to teach physical education and coach track & field in the suburbs of Portland, OR. Perhaps her proudest track & field moment was as a coach when she had the distinct pleasure of coaching the young lady that not only broke, but shattered, the school records she herself had held. After several years teaching and coaching high school track & field, Julie left coaching until she was motivated to get back into the sport by her grand-daughter. As a result, Julie has been a huge part of the success at the King of Prussia site of HBTC.